Russ & Daughters has been around since 1914. The store itself, an upscale Jewish deli located at 179 East Houston Street, is especially acclaimed for its lox, smoked meats, and caviar. 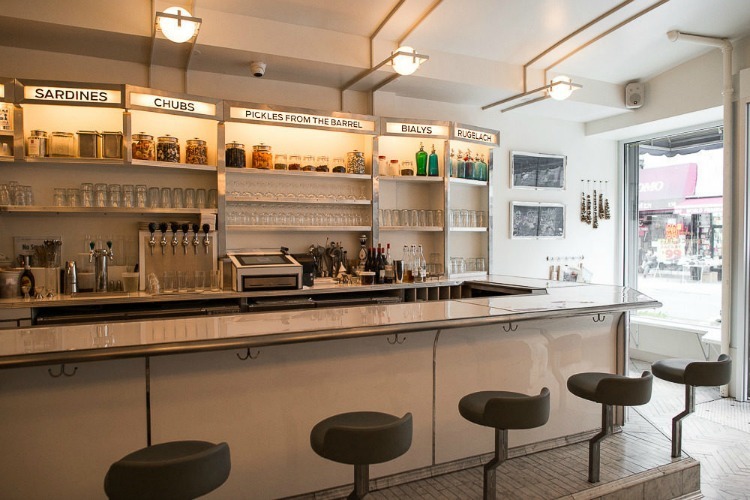 This year, in honor of its 100th anniversary, the franchise opened a cafe at 127 Orchard Street. We, Sophie and Simone, recently stopped by to check out the scene, and now we’re hitting the typewriter (just one, we’re sharing) to let the BHSEC community know what we thought! We were exuberant last Wednesday as we strolled down Rivington St., dreaming of the Jewish meal that awaited us at the Russ & Daughters Café. We finally arrived at Orchard Street and entered. As we walked through the glass doors, the dirty street transformed into a pristine white-tiled interior. At the front was a retro-style lunch counter, occupied mainly by young men in Hawaiian shirts and round glasses chatting and enjoying nicely plated bagels, while old Jewish couples inhabited the booths in the back. The cafe had a classic fifties’ feel, complete with soft jazz music and art deco light fixtures, while white tiles, countertops and waiters’ uniforms gave the delicatessen a more modern feel. The two of us picked up our menus and immediately ogled at the prices. It’s not that the food was insanely expensive, but compared to a seven-dollar sandwich from Adinah’s, it seemed a little pricey. Most of the entrees cost around twenty dollars (discounting the two thousand dollar caviar one might choose to treat one’s self to). We chose to split an order of potato latkes with applesauce and sour cream ($9 for three latkes) and the “Eggs Benny,” eggs benedict on challah bread ($18 for two eggs). As we waited for our food, we watched as chefs in the open kitchen across from us carefully cut slices of smoked salmon and plated dishes, while a muscular waiter stopped by several times to silently refill our glasses with a bottle of water already on the table. It wasn’t long before our food arrived. We stared down at the two beautiful eggs and three gorgeous latkes and, after a short pause, began to dig in like animals. The presentation was beautiful and the first couple bites were bliss, but once we had satiated our initial hunger, disappointment began to roll in like the dark clouds of a thunderstorm. The latkes were tiny, though crispy. The thick challah of the eggs benedict soaked up too much of the egg yolk and the hollandaise sauce was lacking in tangy flavor, despite its promising vibrant yellow hue. Overall, just not enough bang for too much buck. Maybe we should have ordered the “Hot Smoke/Cold Smoke” (baked salmon and Scottish smoked salmon spread with waffle-cut potato chips), our waitress’s personal favorite, but alas. Although the ambiance of the Russ & Daughter’s Café may have been an 9/10 on the Soph-mone Scale of Perfect Dining (it’s an established thing), the food and prices unfortunately fell short and left us sulking to Economy Candy for some sunshine to clear away the rain. Previous Lower Eats Side: Coffee!